Norman provides extensive expertise and inventory in a complete range of standard, miniature, economy, compact, precision, vacuum, hi-flow, pilot-operated and specialty air regulators from Fairchild to meet all of your service needs. High Precision Pressure Regulators - The Fairchild Models 10 and 81 two-stage are ideal for general precision pressure regulator applications, while the compact Models 30 and 80 offer high precision in a small package. The Model 100 high flow regulator, the1000 no bleed high flow regulator and the Model 4100A Low Pressure regulator also offer high precision control. Back Pressure Regulators - Work well where applications require high precision control of back pressure or relief pressures. The Fairchild Models 10BP and 30BP offer high precision. Models 50BP Polymer, 66BP Stainless Steel and 4000ABP High Flow back pressure regulators are designed for tough applications. Miniature Pressure Regulators - Fairchild Model 70 offers high precision in a tiny package. Model 72 High Performance Miniature regulator features an improved design for even better performance, while the Model 50 Polymer regulator excels in lightweight, medical or tough applications. 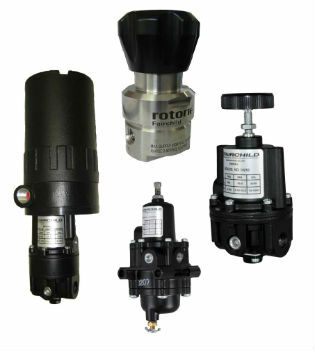 High Pressure Regulators - For applications involving high supply pressures of up to 6000 psig. With stainless steel construction and a variety of seat materials the High Pressure Regulator can be tailored to applications using gas or liquid media at temperatures up to 500 degrees Fahrenheit. Vacuum Regulators - Vacuum regulators cover all applications, from full vacuum in the Model 17 vacuum regulator and Model 18 vacuum relief regulator, to those in low pressure and lighter vacuum, handles by the Model 16 Vacuum regulator and the Model 1600 High Flow Vacuum regulator. Filter/Service and Specialty Pressure Regulators - High flow and good filtration are critically important and the Fairchild Model 63 and slightly wider Model 65 filter service pressure regulators offer world class performance on both counts. In addition to standard products, Specialty Pressure Regulators, such as the Model 2400 standard, low, and high pressure series Motorized Regulators were developed by Fairchild for fast and convenient actuation and automation. You Have Challenges. We Provide The Solutions.